"Approaches and Benefits of Network Virtualization"
Businesses today aspire to achieve a software-defined datacenter (SDDC) to enhance business agility and reduce operational complexity. However, the SDDC solutions available today forgot about the most complex part of your infrastructure—the network. 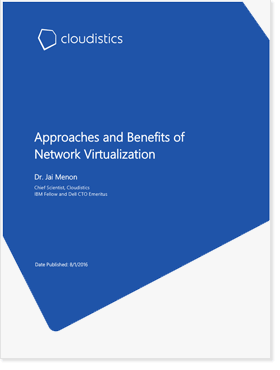 Network virtualization is critical to simplify application scaling and improve application performance without lengthy maintenance windows and potential security risks. Simplifies and automates network provisioning, avoiding manual errors common when dealing with physical networks, VLANs, etc. Copyright © 2013-2018 Cloudistics, Inc. All rights reserved.